For the record I am NOT a Democrat nor a Republican and I am, like most Americans NOT happy with either party. This story is not about politics, but instead about what happens when you don’t plan, test and launch a web application successfully. further this article will speak a little about honesty in marketing. Any comments that try to say that I’m saying these thing because I don’t agree with the politics of the web site will not be published, as will any comments that rant about one political viewpoint or party. We welcome all comments that focus on the marketing or technical aspects of this web application. First we’ll address the “doesn’t work” part, then after the fold we’ll address the part where it isn’t what it says it is. On the first day I heard of it, I went to check it out. It displayed nothing but a blank screen. I checked the source code, there was the complete source code for a blank html page. Well stuff happens I guess. So I checked back a few hours later, same thing. So I tried in the wee hours of the morning, same thing. I don’t know how they think this is okay, but if this was my web application, it would have been ready for the massive amount of traffic on launch day, it would have been thoroughly tested before release and any errors that somehow made it through this process would have been fixed promptly. If not, my efforts would be considered and absolute failure. Given the GOP and Microsoft have access to so many more resources than me, these failures are completely unacceptable. Now it’s three days later and I go there and, lo and behold, we get a front page. But that’s all. 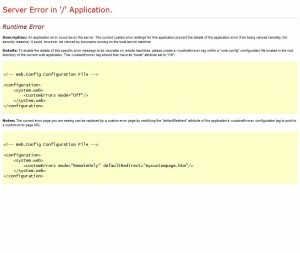 All the pages linked to on this page, return the famous asp.net error screen (which some say is a huge security hole in asp.net web applications). See screen shot above. There is a video on the front page. It does work. Sadly it’s hosted by youtube and has all Google’s tracking systems intact. Really? The GOP can’t afford to and Microsoft doesn’t have the know how to host it’s own video? They really think it’s okay to give up all that info on it’s users just to avoid hosting their own video? BTW, youtube.com is owned by Google which is Microsoft’s #1 competitor. I’d have to say that using youtube to host this particular video on this particular web site and Epic Fail, wouldn’t you? The video goes on and on about how they want the public’s input on policy. The info the founder (Kevin McCarthy) released to the press used the phrase “virtual town hall meeting”. The site couldn’t be anything further from that. But it is designed to make it look like one. At a town hall meeting, if you speak at the podium, you’re voice is heard and it becomes a part of the permanent record. At americaspeakingout.com if you speak they will decide if the “public” (most of the site is only for registered members, not the public) gets to hear it and if they don’t like, it is moved to the secret record, where only they can see it unless they want to use it to prosecute you. Also they can bar you from ever speaking there again. Once this site finally starts working how long until there are complaints about people ideas being removed? In a town hall meeting, if someone impersonates you and does some kind of damage, (burns the carpet or something), no one would or could dream of trying to to hold you responsible. However americaspeakingout.com (AOS) will absolutely hold you responsible if this happens on their web site. Yup, that’s right, if someone hacks their web site (and you know they will), and they happen to pose as you, AOS says they will hold you responsible. Wow, talk about out of touch with reality and being mean spirited! In a town hall meeting, if someone is passing out flyers, you can take a copy. At AOS, you need to do your research first or you may be prosecuted! In summary I’d have to call this attempt at a web application a failure. Because of the huge names, huge resources put into it and how far from successful the launch was I’d have to say that, at this time at least, this web application is an epic failure. In time, perhaps they’ll probably get this web application working, but I doubt it’ll ever be what the marketing is purporting it to be, that being a place where all Americans can go and present their ideas to Congress and give feedback on others ideas. How dare you? It is NOT OK TO MAKE FUN OF THE GOP. You re jus mad because your blck! I don’t know about you, but I’d ever tolerate that kind of performance at my company. If it didn’t work, it wouldn’t get launched. You’d think Microsoft would know about “load testing”. Whoops, they say they do . . .
Hmmm, maybe that’s why they have to resort to illegal monopoly building to sell thier products? I’m thinking it’s perfectly ok to launch a product before it works for the public. This way you can fufill the contracts deadlines and still get paid. Isn’t that what it’s all about? If the client complains you can just show them the development copy of the web app and say “it works fine for an overwhelming percentage of users, but we do hear that a very small amount of people are having problems and we’re working diligently to fix that. By the time the statistics come out to show that’s not the truth, you’ve already been paid. Will they fire you? Probably not, business is about relationships, not performance. That’s why you have to hav a great sales team. that’s far more important than “products that work”. I found your post looking on google for just this information. I’m going to add you to favorites, I will read a lot from some of your other posts as well. Thanks! I recently found this excellent website by Yahoo and I just needed to take a few minutes of time to say many thanks for the helpful epic traffic systems review that you supplied on your web site. So really, what did you expect? Where talking about a dysfunctional corporation and an evil American political party. Did you think they could possibly made something that worked? did you really think they would make something that served the public?